Recently the #ReleaseTheSnyderCut movement has grown in online relevance, and an article in the Wall Street Journal has been published. Many have called the article the end of the Snyder cut movement and proof they should stop fighting for it. While the article has one quote from an executive at Warner Brothers that many have latched on to, the article is extremely misleading, mischaracterizes the movement and ignores a lot of information important to the movement, in favor of using a tweet with 30 likes to make the movement look like a cult. The main thing the article misses is that what Warner Brothers did with Justice League was wrong. Warner Brothers lied to and scammed people. People were told by Toby Emmerich that “The directing is minimal and it has to adhere to the style and tone and the template that Zack set”. It is unclear how the Flash falling on Wonder Woman bit (which was also used in Joss Whedon’s Avengers: Age of Ultron) is adhering to Snyder’s tone, style or template. It is also unclear how Lois Lane, a character treated respectfully as an important hero in the previous films when she saves Superman and Batman and is the one who proves Lex guilty, being called “thirsty” fits within Snyder’s tone or template. Even ignoring these small bits which outraged fans, there are larger changes which affect the film and don’t adhere to the style, tone, and template that Snyder set. 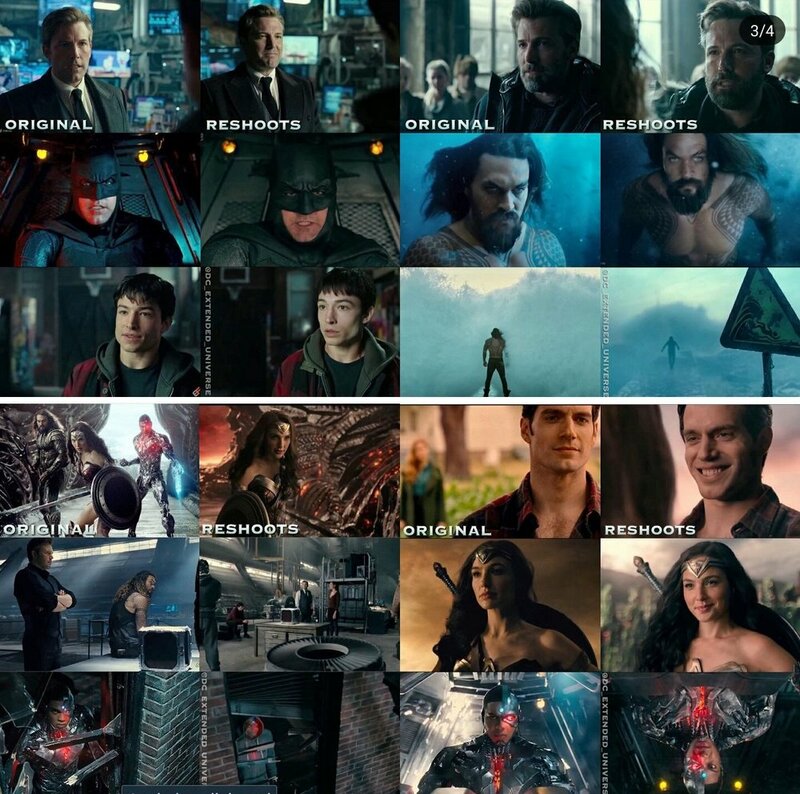 The character journey and exploration that Snyder and Terrio set for the characters Superman, Batman, Flash, Cyborg, and Aquaman, were all diminished. Entire scenes were removed. This is known from trailers, interviews, leaked footage, and storyboards. In addition, the main villain Steppenwolf’s motivations were removed, and he was made a far worse villain. The actor who portrayed Steppenwolf said in an interview before the film that Steppenwolf is “old, tired, still trying to get out of his own enslavement to Darkseid, [but] he has to keep on this line to try and take over worlds.” None of that is in the film, except him being old. Ciaran Hinds, who played Steppenwolf, said “That wasn’t the movie I worked so hard on. We hope the director’s cut comes out because it was better than the movie in the theaters.” Steppenwolf at one part in the theatrical version says “For Darkseid”. This line makes no sense to people who aren’t comic book fans, considering the character Darkseid is never shown in the film, and this is the first time he is mentioned in the entire film series. We know for a fact that Darkseid was in Snyder’s version of the film due to storyboards of Darkseid he posted on Vero. Joss Whedon and Warner Brothers cut out the entirety of the characters, Vulko, and Iris West. It is unclear why Snyder would cast and film characters if they did not fit his template. In addition to these story changes which do not fit Snyder’s tone, the visuals are clearly different. Snyder’s shots are higher contrast, more detailed and shot on film. Meanwhile, Whedon’s visual style is different being less dynamic and visually striking, as well as being less detailed and shot on digital. In addition, cinematographer Fabian Wagner revealed he did not shoot the reshoots during a Collider interview: “And then the reshoots that obviously Zack didn’t direct and I couldn’t be involved in, unfortunately, as I was on a different project, and they decided to shoot that on the 65. We shot all of our stuff on the 35.” The visual style and template Snyder and Wagner created were not adhered to by Whedon. The quote about adhering to Snyder’s tone, style, and template wasn’t the only lie given in that same exact interview. In fact, there was another lie in the exact same paragraph of that interview. Emmerich said “We’re not introducing any new characters. It’s the same characters in new scenes.” This is obviously factually incorrect. A vero user mentioned the Russian family who are in the theatrical version of Justice League. Zack Snyder, who never saw the theatrical film, responded “What Russian family?” If the Russian family was in Snyder’s cut , then he would be aware of it and not be asking about. The Russian family is an example of new characters that they introduced, which goes against what Emmerich told people. In addition to these lies, in an effort to appease blind haters, WB trashed on previous films and invited people who hated on previous films to the set. WB used Snyder as a scapegoat instead of taking responsibility for their horrible PR and marketing with BvS, which led the film to get worse reception and returns. Though the box office of Batman V Superman: Dawn of Justice was lower than expected, not including marketing, the film brought a profit of about 696 million. Justice League brought a profit of about 405 million. Also, keep in mind that these numbers aren't exactly accurate considering long actor contracts, set building, props, and such are listed on the budget of the first film they are used on. For instance, Ben Affleck’s three-film contract as Batman is all put on the budget of Batman V Superman and not Justice League. The same applies to all the league members who first appear in Batman V Superman. It also applies to the building of large sets, costumes, and expensive props such as the Batmobile. This is why some sequels such as the Amazing Spider-Man 2 have a lower budget than the first film, despite the sequel being more vfx heavy. What this means is that the budget for Batman V Superman is actually lower than listed, and Justice League, in reality, has a higher budget than listed. Not only were the people lied to, they were also scammed. Although the total amount of presales is unknown, there were plenty of people who went into the film thinking they were getting the one promised in interviews, press releases, and trailers. Unfortunately, that isn’t what they got. As shown previously, the film in theaters is substantially different than the one promised. Fandango had Justice League at a 97 out of 100 Fanticipation Rating. Reports seemed to indicate that it was outpacing Wonder Woman in pre-ticket sales. In China, it was on par with The Last Jedi in presales. Those are all people scammed, in addition to many others who bought tickets later. For any who think this language is too strong, here is a definition of “scam” from Business Dictionary: “A fraudulent scheme performed by a dishonest individual, group, or company in an attempt [to] obtain money or something else of value.” This definition is completely in line with the situation described in this article. Not only does the Justice League situation affect the people who were lied to and scammed, it also affects society. Economies are based on trust. The abstract of Syracuse Professor of Economics Jerry M. Evensky’s paper on Adam Smith says “when trust is shaken, individuals pull back and the market system contracts. Where trust grows, individual energy and creativity are unleashed and the system grows.” Obviously, it is extremely unlikely that an economic depression would result from Warner Brothers not releasing the Snyder Cut, and nobody is saying that it would. However, in market economies, corporations need to be held accountable by the people through public opposition and outcry. If there isn’t Warner Brothers and other corporations will think what they did on Justice League was ok, and they will repeat it. It will also hinder the ability of smaller companies to create better films and bring them to the masses. On a cultural level, releasing the Snyder Cut is also important. Snyder’s past films have dealt with subjects and gave messages that are important in today’s society. These include the morality of drone warfare; media manipulation; the flaws of existentialism; xenophobia, the feeling of powerlessness after threatening events that turn good people towards what they see as outsiders; how people and governments around the world are giving up moral high ground and trading in the great parts of their founding ideals, justice, rights, and security in exchange for a sense of security and vengeance. There are many more that could be listed, and there are plenty of analyses which do a great job delving into and analyzing the themes and messages, which are very important in our current culture and society. One of the biggest claims made by those who oppose the movement is that “the Snyder Cut does not exist”. Does the Snyder Cut exist? Absolutely. In the words of Justice League storyboard artist Jay Oliva, “Yep it exists”. How finished is the Snyder Cut? That is a different question. We know for a fact that the principal photography was done, the film was edited, some CGI work, some of the score, and sound mixing and ADR were being worked on in January. How much of the score and CGI is done, we do not know. As far as we know from official sources and not rumors or reports from unnamed sources, the film is not finished but it is farther along than the assembly cut some claim it is. There are is some minimal reshoots probably needed and vfx work done. Under the DGA, directors receive a minimum of ten weeks afar completion of principal photography. Justice League ended filming in October 2016. Snyder left in March 2017. There is plenty of time there that the film is far past the assembly cut that some claim it is. The Snyder cut movement is also seen as pointless and fighting for something unrealistic. The people who wanted Young Justice Season 3 were seen as fighting for something pointless, yet that was announced. Same applies to the Clone Wars revival. Same is being said about the Snyder Cut movement. Just because something may seem unrealistic, does not mean it is not worth supporting. Both of those shows happened, and most would see world peace as unrealistic, yet most would support it. (World peace is far more important than the Snyder cut, this is just a point meant to illustrate how just because something seems unrealistic, does not mean people shouldn’t support it.) The Snyder Cut movement just needs more public backing and outcry. It really makes no sense why people would be opposed to the movement. If you aren’t a fan of BvS and Man of Steel, that is fine, but you should still be against what WB did as your favorite film series could easily do it and it could be easily be done to your favorite director. Even if you don’t think that would happen, you should still be against lying and scamming. If you liked the theatrical cut of Justice League, that is fine. Many people who like the film support the movement. Nobody wants to destroy the copies of the theatrical cut. They just want the film they were promised and paid for. This is a good movement that is fighting for a good cause. While it is called Release the Snyder Cut, it is important to mention all the other great artists whose work was changed, from the Oscar-winning Chris Terrio, Junkie XL, the Emmy nominated Fabian Wagner and the entire crew who worked on the film. The Wall Street Journal article mischaracterizes the movement and is extremely misleading. Instead of mentioning how Batman V Superman and Watchmen got theatrical cuts, and how Jay Oliva supports the movement, they instead focus on a bad tweet with 30 likes in an effort to make the movement look like a crazy cult. The article also ignores many of the important the reasons fans support the movement as mentioned in this article. In the Wall Street Journal article, the journalist gets a quote from “one person close to the film” who “lamented”, “Who are these people who won’t stop talking about the magical Snyder cut that doesn’t exist?” It is me and all the others who are against a corporation lying to and scamming people, as well as using a person innocent of what they are accused of as a scapegoat. If they would like us to stop talking, they can release a public apology or #ReleaseTheSnyderCut. GUEST ARTICLE BY SCOTT L.